Thursday is our traditional Thanksgiving holiday. But this year Thursday is also the first day of Hanukkah, the eight day Jewish holiday also known as the Festival of Lights. The holiday commemorates the re-dedication of the holy Temple in Jerusalem following the Jewish victory over the Syrian-Greeks in 165 B.C.E. The eight days of Hanukkah refer to the purifying ritual of that took place in the Temple after their victory. Because the Temple had been defiled by foreign gods, it was determined that it must be purified by the burning of ritual oil in its menorah. They discovered that there was only enough oil for one day but lit it anyway. It burned for the required eight days which was considered miraculous and gave rise to the Hanukkah celebration. This is the third time the two holiday have converged since President Lincoln proclaimed Thanksgiving a holiday here in 1863. The first two times, 1888 and 1899, occurred before the current laws which dictate that Thanksgiving fall on the fourth Thursday of November. This is the first time since the law went into effect and will the last time the two holidays fall simultaneously until the year 79811, as calculated by a physicist with some extra time on his hands. Can you hear me laughing? No? I’ll replay the video. 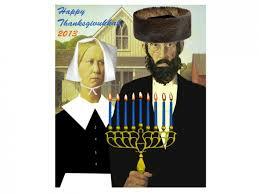 Hope your Thanksgivukkah is the best one ever, Linda! Great video! I think I’ll open a cold He’Brew and watch it again. Crack open another He’brew, it’s Thanksgivvukah! Have a great Thanksgivukkah, Julie!